So, the first city I visited this year was Bologna. I confess, I’m a little obsessed with the Italian way of life and Italy as a whole. From a young age, Italy has always fascinated me – it has a compelling air of mystery - and it’s where I’ve had most of my holidays. I remember travels with my mum to Lake Garda – we’d leave my dad and brother at home - and it’s still one of my special places. I’m not sure what persuaded me to visit Bologna, perhaps I read about it in an Italian murder mystery book, I’m not sure…but what I do remember is my first impression of the city – it was mixed. I admit it wasn't love at first sight, but after taking a wander, it became instantly charming, and I yep, I fell in love – I always ask myself after I return home from a city “would I go back?” and “yes” is my answer to Bologna. Bologna’s narrow streets are lined with porticoes – some grand and others crumbling make the city feel ancient, which I love. La Dotta honours the university, the oldest in the western world, and still one of the most respected places to study in Italy. There are lots of students here, which make the city feel young, alive and buzzing, despite its age. La Grassa pays homage to Bologna’s temptingly cuisine. It’s known for producing some of the most delicious food in Italy – just ask an Italian. You only have to walk along the Pescherie Vecchie street – right in the city centre – to be confronted on every corner by a tempting assortment of irresistible food choices. Seriously, if you’re a foodie, this city will delight the senses, and yes, you will pop on a few extra pounds. The famous Bolognese sauce isn’t the only thing the city has to offer up food wise. You’re also in the home of Parmesan cheese, Prosciutta ham, and a cooked ham known as "mortadella". I confess, I’m pescatarian, so I didn’t try the ham. I promise you this though, everywhere I looked, I saw young and old alike sitting at trattorias and cafés eating cold cuts from platters….and it was a little tempting! I think it’s safe to say ham is a pretty sacred meat to the Bolognese! If you taste nothing else – ok, well apart from the gelato – be sure to try the authentic Balsamic vinegar from Modena. You’ll even find it on gelato. Suffice to say, Balsamic is liquid gold here. I love a good food market – especially an Italian one. The buzz of the stall holders shouting to each other in Italian and me just standing there watching, brings a smile to my face now, just thinking about it. 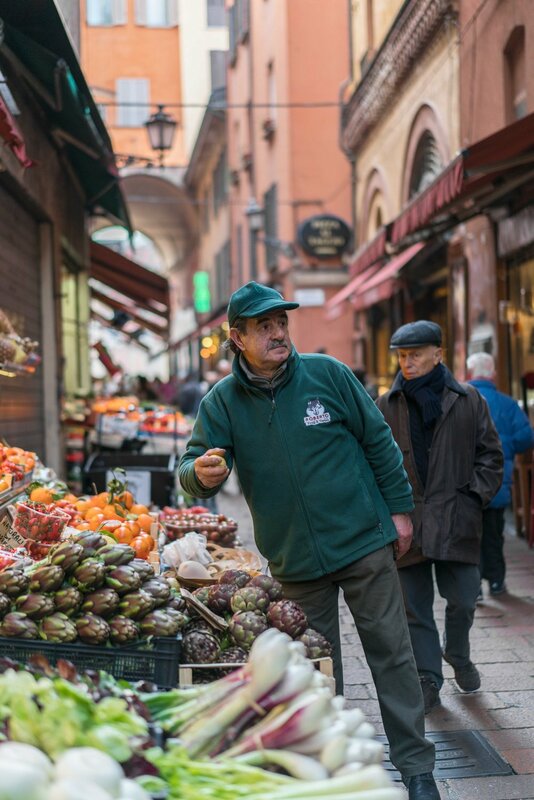 Bologna’s oldest market is a must visit with stalls selling delicious baked bread, handmade tortellini and fresh fishes well as fruit and vegetables. I don’t think you can beat the taste of fresh Italian tomatoes. If I thought I’d manage to get some home in my hand luggage, I would! And, lastly, La Rossa, meaning the red one. You’ll see this straight away - red buildings, crumbing walls and pretty rooftops. It also comes from the red of the Ducati motorcycles and Ferarri’sBefore you start exploring the buildings, stop in the middle of Piazza Maggiore – it’s the heart of the city where the Bolognese gather, night and day to sit, read, meet, chat with friends, and generally hang-out. It’s a really beautiful spot to take in some sights including the Palazzo Comunale, Palazzo d’Accursio, the majestic exterior of San Petronio church and Palazzo Re Enzo. What I loved most about the city was how untouristy and uncrowded it felt. I mean, sure I saw tourists, but the locals intermingled with them, so I never really noticed them and to me that made the city feel beautifully authentic. For me the best way to see a city is on foot – but, hey I love walking, it’s my choice of exercise - but honestly, the best way to see Bologna - and the easiest - is on foot. You’ll see so much, plus you’ll walk into unexpected streets that’ll leave you wondering about its past. I want to share some of my favourite spots in the city. I already touched on the heart of the action Piazza Maggiore. It’s a delightful piazza to stop, take a few photos and also to rest. Facing age-old medieval buildings including the Basilica di San Petronio and the city hall, I wandered here a few times a day whiling away time between exploring and snapping - I was lucky my hotel was ideally placed a few minutes’ walk away, so this spot was perfect for me. 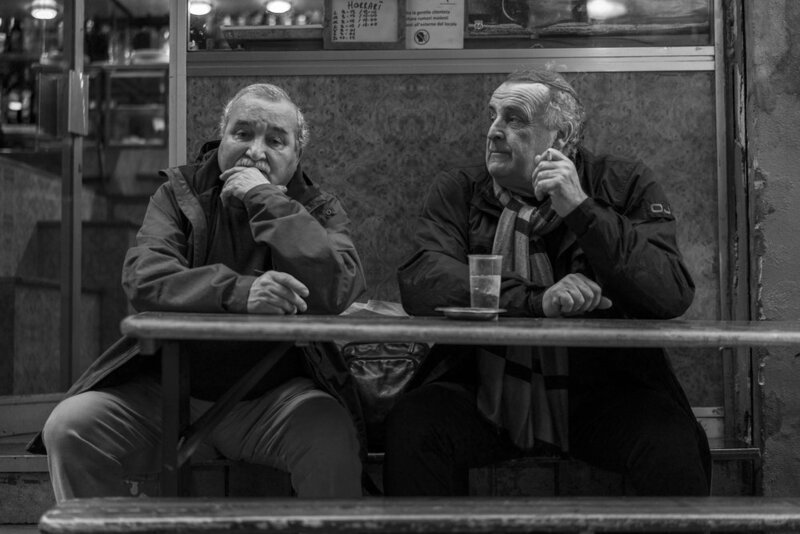 I’d grab a freshly baked croissant and hot cuppa for breakfast, and simply put, I watched locals start their day. The atmosphere changes throughout the day, so off I’d go for an amble and then at gelato o’clock, I’d head back = a very happy me. There are a few lovely little cafés all around the piazza and side streets serving espressos, pastries, food, gelato and good people watching, all making for a very chilled out vibe. My favourite afternoon was spent sitting in the sunshine at Piazza Maggiore; the beautiful carefree feeling of being in a new place with my camera ready to explore; the winter sun on my face and simply people watching the afternoon away – my idea of bliss in between taking photos. You must, must, must climb Bologna’s Torre Asinelli degli tower – a quintessentially Bologna experience. I loved the view so much, I climbed it twice! There are two towers – Asinelli being the one you can climb and Torre Garisenda. Interesting fact, the two towers used to be interconnected with a walkway and suspended passageways running everywhere – it’s difficult to image this today when the towers now appear completely separate. The steps up to the top of the Asinelli will have you gasping for breathe a little, but the steps can be forgiven, and I promise you, the view is absolutely stunning. The light in the city sure was special and at night street lights illuminate the city casting intriguing shadows glowing gold and orange. Evening time feels so safe to stroll about too. I was lucky to enjoy some of the most beautiful winter light I have ever experienced – I’ll never forget the light here, and nothing could have moved me from the spot below. I stayed until the sun completely disappeared. I remember seeing a photo of La Finestrela (above) on Instagram, and I knew I’d enjoy the mission to find it. This hidden gem – located around the Via Piella - may be a little over rated, but it’s worth the hunt to find it; you’ll find lots of hidden alleyways and streets to discover as you wander the quiet streets. You’ll also find some of the best restaurant in the area. Bologna really is perfect for a weekend exploring. There’s plenty to see and do in the city itself. From the sights to the trattorias, gelaterias and salumerias. Plus, you’re perfectly placed too should you wish to extend your stay and visit Florence and Venice. It’s a pretty simple journey to get there - about one hour away by train.